Just over 116,000 modifications are now permanent. Here is the link at Treasury. See here for a list of reports. 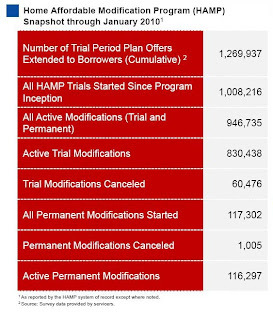 If there were 416,471 cumulative HAMP trial modifications in August - how come there were only 116,297 permanent mods and 60,476 disqualified modifications by the end of January? The numbers don't add up. What happened to the other 240,000 modifications? 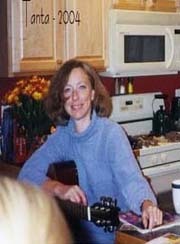 I guess they we will find out in the February report when the servicers start removing delinquent borrowers from the trial modification program. 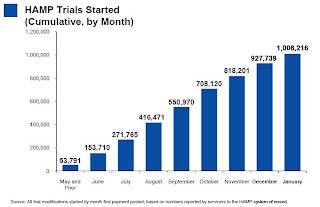 Notice that the pace of new trial modifications has slowed sharply from over 150,000 in Septmenber to just over 80,000 in January 2010. This is slowest pace since May 2009 and is probably because of two factors: 1) servicers are now pre-qualifying borrowers, and 2) servicers are running out of eligible borrowers. Edit: Also - 1,005 permanent modifications have already failed. At first that seemed high considering those borrowers made all the trial modification payments ... but I suppose that is about the expected re-default rate.